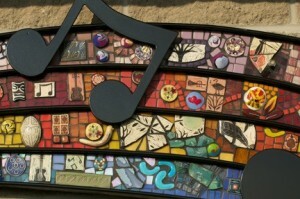 “Sunset Melody” adorns the Peg Egan Performing Arts Center in Egg Harbor. Photo by Len Villano. 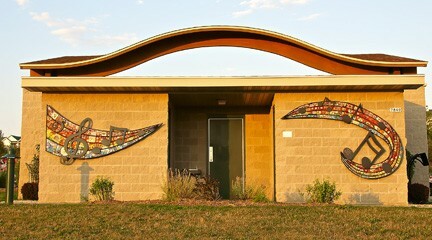 The beautiful geography and impressive amphitheater that comprises the Peg Egan Performing Art Center in Egg Harbor went up an octave with the addition of “Sunset Melody,” a 16-foot sculpture which graces the west side of the performance center and will reside for at least the next few years. The melodious mosaic, which took over nine months to complete, is held in place by a steel fabrication. The process bonded the four artists who invested so much creativity and cultural inspiration from the community at large. The four smiling artists who collaborated on the sculpture warmly greeted me on an early Friday morning. I walked up and marveled at the bright illumination which softly glowed on the concrete walls of the center. Intrinsic to the piece was the clear contribution of the artists’ own unique interests and backgrounds within the artistic community, and the beautiful harmony that was created through this artistic blend. 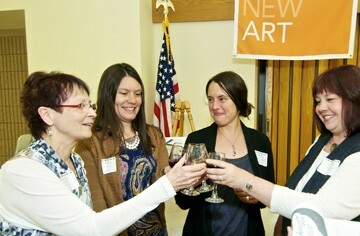 (Left to right) Kathy Mand Beck, Angela Lensch, Renee Schwaller, and Cynthia Board toast to the installation of their collaborative piece, “Sunset Melody.” Photo by Len Villano. The four artists, all locals within the community, include Angela Lensch, Plum Bottom Pottery’s resident jewelry artist and the leader in the fabrication of “Sunset Melody’s” metal framework. Kathy Mand Beck, owner and resident artist of Dovetail Gallery & Studio in Egg Harbor, provided the eggshell and polymer tile inlay while Renee Schwaller, clay artist and owner of Off the Wheel Pottery in Egg Harbor, contributed glazed tile pieces. Cynthia Board, the sculpture’s fourth contributor and a self-described “mosaicist” is represented at Off the Wheel Pottery, was an integral component in the unification of all the artistic elements represented in the piece. Each artist systematically described their background within their artistic field and how that influenced the metallic song overlooking Egg Harbor. When asked about inspiration behind the piece, Mand Beck aptly stated that “Peg Egan herself” was an inspiring figure and natural beauty and wonder of Door County is evident inspiration as elements of the pristine county are evident within the piece. Board carefully pointed out tiled pieces that represent the beauty and novelty that permeates the northern peninsula. Images of Peninsula State Park, the always-popular local fish boil, and the aesthetics of the annual Plein Air Art Festival are also evinced within the piece. These vignettes, or, “little stories,” as Board astutely referred to them, convey to the viewer the events and places that are woven into the long arm of the peninsula. The piece, as Board commented, “Begs to be touched.” Its smooth composition is a harmonious sonnet to the hand of the viewer. Pottery and eggshell pieces blend together in perfect orchestration. The camaraderie of the four artists is apparent through their interaction and appreciation for one another, both as individuals and as artists. The mosaic in-and-of itself is emblematic of the union forged throughout the nine-month tenure of their collaboration. Their unique bond as artists and individuals is a projection onto the amphitheater walls and is a visual necessity for both artist and non-artist alike. The artists extend a special thanks to the Village Board of Egg Harbor; Egg Harbor Public Arts Committee; Josh Van Leishout, Village Administrator; Jeff and the Public Works Crew; Bob at Mastercraft; Bev and Tom Prohl; and many others that shared their knowledge and helping hands. For more information about “Sunset Melody” and Egg Harbor’s numerous art installations throughout the village, call 920.868.3334.